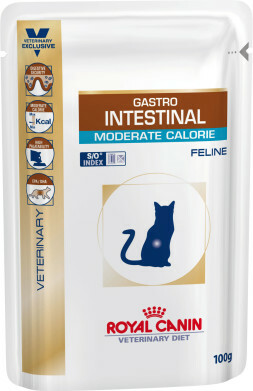 Gastro Intestinal Moderate Calorie (wet) For overweight, neutered or inactive cats (prone to weight gain) or with acute and chronic diarrhoea, Inflammatory Bowel Disease (IBD), maldigestion, malabsorption, small intestinal bacterial overgrowth (SIBO), colitis, gastritis, pancreatitis. Cats suffering from digestive disorders often show a decreased appetite and weight loss. High palatability encourages spontaneous consumption, facilitating convalesence and recovery. Poultry and pork meat, poultry liver, corn flour, maize gluten, cellulose, powdered egg white, minerals (including chelated trace-elements), fish oil, gelling agents, hydrolysed yeast (source of Mannan-Oligo-Saccharides), marigold extract (rich in lutein), vitamins. Crude ash: 1.3%. Crude fibre: 1%. Crude oil fats: 2.7%. Moisture: 82.5%. Protein: 7%. 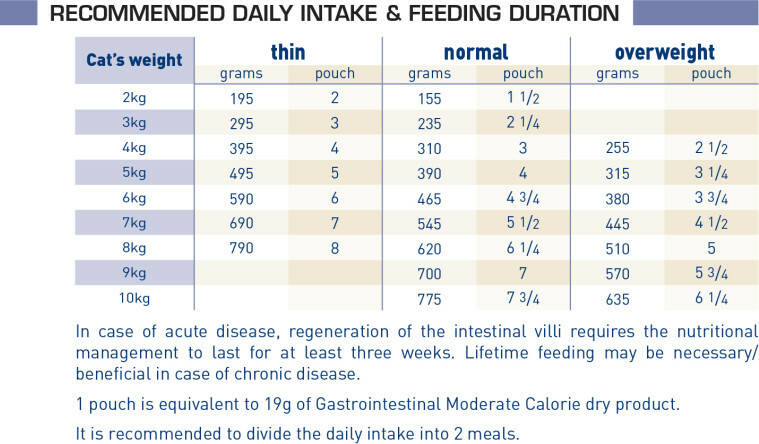 Vitamin D3: 220IU, E1 (Iron): 7mg, E2 (Iodine): 0.02mg, E4 (Copper): 0.01mg, E5 (Manganese): 2mg, E6 (Zinc): 20mg.